Stuffed peppers are a pretty well-loved recipe in many families. It’s cosy and comfy, yet it’s humble. Peppers show themselves in abundance – especially during summer months – and if you have a garden, you’re probably used to finding creative ways to use them up. Fortunately, opting for stuffing provides a blank canvas for creative meal ideas, unique and tasty fillings and really delicious leftovers! The stuffed pepper is easily customized to your taste, and that’s why we dig ’em so much. Quinoa is a naturally gluten-free seed (not a grain!) packed with fibre and protein. It’s low-glycemic and well-tolerated by many – even those who avoid grains. It comes in three different colors, and it’s pretty packed with vitamins and minerals making it a pretty healthy choice. It’s quick to cook, especially compared to rice, and it’s relatively inexpensive to buy, so it’s nice to have some handy. It can be used as a filler, a rice replacement or to make tasty brekky porridge. Today’s focus is on interesting ways to make quinoa stuffed peppers. Trust us – there are plenty! Stuffed peppers are generally thought to be a little meat-heavy, with the standard filling being a mixture of rice and beef. While we love the classics, we also love a good meatless recipe! Quinoa provides complete plant protein, so it’s a satiating component in a vegan or vegetarian stuffed pepper recipe, which is something that rice is lacking in. We love quinoa mixed with other veggies, sauces and tasty additions. Here are some tasty recipe ideas. These guys are loaded up with extra plant-based protein with black beans, and they feature some corn to add a bit more bulk. These will nix any Mexican food cravings you’re harboring, and they’re vegetarian-friendly. The sweetness from the bell peppers brings it all together… or it might be the fresh slices of avocado on top to serve. Spinach and artichoke dip is often indulgent and served with crisps, so this healthy spin is something we can get down on. It’s a bit less heavy, and you can feel good about digging into this ooey-gooey, cheesy, veggie-laden recipe. These are filled to the brim with plant protein and healthy fats, so if you’re looking for the quintessential vegan stuffed peppers, this just might be it! Tomatoes and kale boost the nutrient profile while adding a gorgeous splash of color in the filling. These red peppers feature a bit of sweetness and warmth from goji berries and raisins, with a dramatic twist from using black quinoa. The contrast alone makes this veggie option a feast for the eyes and the belly, and it’s vegan-friendly. Let’s keep it authentic by adding some mince into the mix. Grass-fed beef, turkey or sausage lend their lovely flavors and healthy fats to the mix while upping the protein for a perfectly filling main course when you mix it up with some quinoa to create a lovely texture that can’t be beat. There are so many interesting ways to use beef that keep the classic stuffed pepper in mind while breathing in new life to your grandma’s recipe. Here are some of our favorite spins on beef and quinoa stuffed peppers. Who doesn’t adore chorizo? We kinda, sorta love it, and it’s made even better tossed into a zesty pepper and topped off with crema. Avocado crema, of course. The quinoa really balances out the heaviness from healthy-but-fatty chorizo, and it makes a good breakfast, lunch or dinner. The stuffed pepper is a fabulous recipe for the slow cooker, and an undeniably awesome meal to come home to. Set it and forget it with this luscious mixture of rice, beef and quinoa. Add some veggies to it while you’re at it. Why not? Sloppy Joe’s are the quintessential weeknight meal, but don’t let yours come from a can. No need to stack it up between two buns, either. This low-carb option is cheesy, saucy and lip-smackin’ good, plus perfectly healthy if you ask us. You could top these off with nutritional yeast, too, if you’re avoiding dairy. Turkey and quinoa team up with dried currants, fresh parsley and feta cheese for a lovely, zesty stuffed pepper recipe you’ll want seconds of for sure… so just double that recipe, and you’ll be good! The bird is the word, so why not add some chicken? This brings home the lean protein game for yet another complete meal on the table in no time. Poultry adds juicy, tender flavor to the quinoa blend, and you can really encompass those time-honored chicken recipes – teriyaki, BBQ, buffalo and beyond, we love these chicken and quinoa combos to the moon and back. Spinach, sun-dried tomatoes and a healthy dose of feta cheese give these their Greek flair with plenty of spinach, chicken and quinoa to fill out the peppers. Instead of bell peppers, we’re opting for poblanos in this spicy recipe. The best part is undoubtedly the glug of avocado cream on top to help cool things down and add some healthy fats to your plate. Need we say more than barbeque chicken? This recipe should be a summer staple, and it’s great for using up leftovers from the grill. Who said you couldn’t have stuffed peppers for breakfast? It certainly wasn’t us. We’re all about savory ways to start the day, and we are firm believers in the real food philosophy of putting an egg on it. Quinoa and eggs are a lovely brew to kick off a morning strong with, loading up on sustainable energy from healthy, filling protein, and having some veggies on your plate can’t hurt either. The southwestern spin beneath is a lovely way to spice up your morning routine, and an over-medium yolk to slice into on top and let drizzle down will make these dreamy peppers even dreamier. We’re swooning over this savory idea, and the recipe is only around six ingredients! Score. Make these ahead of time for nutritious, ready-to-go breakfast options. 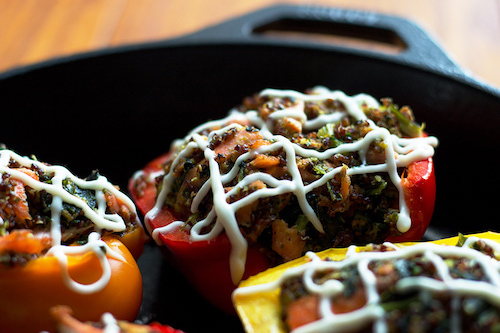 This pepper recipe doesn’t include quinoa, but it would be a fantastic addition. You can swap out some of the sweet potatoes and potatoes for a bit of quinoa, or you can simply mix some in to the hearty sausage blend. To make it even more breakfast-appropriate, bake an egg on top when they’re almost done. Put the egg in the coconut… er, quinoa, and mix it all up! This scrambled stuffed pepper is bound to put some pep in your step for brekky, and it’s totally portable so you can take it with you and easily take bites. Ditch the bacon and egg wrap for this just-as-hearty, just-as-tasty recipe. We know that seafood is amazing for us. It’s a great source of protein. Oily fish are known for their outstanding omega-3 fatty acid content. Some fish are high in vitamin D – a rarity in most food! Wild-caught fish is just as nutritious canned as it is fresh, so it’s also a fabulously economical choice if you’re feeding a big family or trying to save a few bucks. Here are some of our favorite quinoa stuffed peppers from under the sea. Canned tuna isn’t generally thought of as fancy fare, but you can change its association with this scrumptious stuffed pepper recipe. It’s cheap and it’s easy to make, yet somehow, it’s good for ya too. Mexican flavors, fresh cilantro and avocado slices take the cake here. The Sicilian flavors in this one are off the charts with kalamata olives, sun-dried tomatoes, fresh crumbles of feta and diced red onion. You’ll get more bursts of texture with chewy raisins and buttery pine nuts in the filling. These stunning peppers are total showstoppers featuring quinoa, salmon and a delicious cilantro pesto mixed in, taking freshness to the next level. They’re weaved with a happy drizzle of creme fraiche, so we totally get it if you’re drooling now. This creamy filling boasts healthy, delicious and interesting ingredients amongst the shrimp and kale including Pecorino, Greek yoghurt and pepitas so you know it’s just bursting with flavour. This is a light meal that will feel incredibly satisfying. We hope you enjoyed these recipes and found some new, exciting ways to use quinoa in your kitchen! Share this article with someone who could use some spice in their meal prep. Lots of great ways! Thank you for sharing my recipe.